Why are places like Espresso and Dolmen Mall so averse to live music? I’m standing at Alexanderplatz in Berlin, hearing music from three different directions coming from street artists who have set up their hats. One plays under a bridge, another next to a shopping district and a third outside a beer hall. I’m not sure which one to listen to when I get an urgent e-mail from Marium Kamal. Marium is an artist and a fine arts teacher who, in her free time, manages Shikari; a small indie duo who play only original Urdu and English songs in Karachi. I met her and the band quite cosmically at a coffee shop on my last day in Karachi. I used to watch them every day for a few months at the Zamzama branch of Espresso before I ballsied my way to getting their contact details. The coffee house in the crowded lane had organically become a co-working space for the playwrights and poets of the city. While doing many of my interviews, I used to find the band sitting with a bunch of their friends on couches, drinking coffee and singing their original tracks without charge to a creative-minded, music-starved audience working on their laptops. I loved the aspect of live music and they never distracted me from my writing or my subjects. “They banned us at Espresso. Their guard practically threw us out; the waiters even refused to serve us coffee,” she wrote. In her email she spoke of a particular guest named Faheem who had found Shikari playing so offensive that he went and complained to the management at Espresso. Funnily enough, the person who complained about the music in the coffee shop is a professor who teaches critical thinking at a top university. But when the band asked him to share why he was offended by them playing a few instruments, he wouldn’t say. The creative duo responded to this banning, not by punches and kicks to the oppressor, but with satirical art stickers that they handed out to their friends and family. In a month since I had been away, my Facebook feed was inundated with news from Pakistan of alcohol shops being closed down, pushups in cricket being analysed and dance in schools being contested by authorities. “Everyone is policing someone or the other in Pakistan,” says Billy to me from his makeshift studio in his parent’s basement. 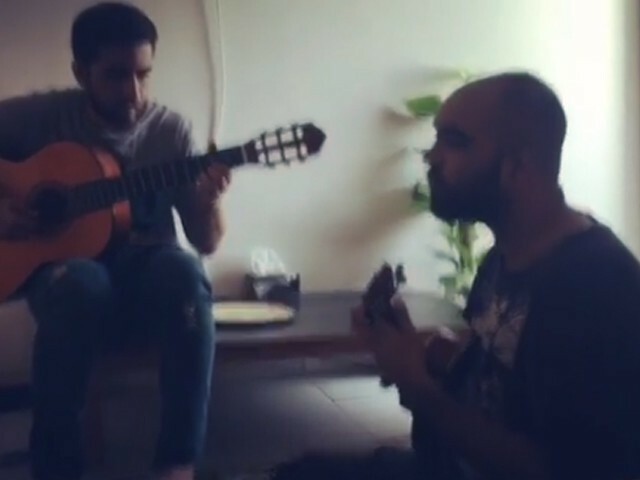 Billy aka Bilal Baloch sings and plays the guitar and ukelele for Shikari in the evenings. His day job is at Ziauddin Hospital teaching music as a form of therapy to children with language disorders and impairments, mental retardation, Down’s syndrome, Autism Spectrum Disorder and Learning Disabilities. The other half of the duo is raspy-toned Safwan Subzwari, a talented musician, filmmaker and visual artist who recently exhibited his artwork at the Fomma Trust. The Columbia College grad returned to Pakistan a few years ago and shot his directorial debut Laal about the plight of women, the increasing rate of forced marriages, and overall patriarchy in Pakistan. Laal is an evocative visual journey through the isolation and struggles of a typical Pakistani girl. The project set him back roughly Rs300,000 which he felt was completely wasted as it was never screened properly on Pakistani TV or the score played on radio channels. I was always under the impression that platforms like Coke Studio, Nescafe Basement and the upcoming Levis Live were really providing a platform to budding artists, but the artists in question disagree. “They’re great platforms if you want to play covers but no one wants to listen or produce original music anymore,” says Billy. This comes as a surprise because the 90s saw tonnes of incredibly talented artists and original Pakistani music. Recently, Shikari have set out on an experiment to see how people respond to music at public spaces in Karachi. “We have no performance spaces where we can try out our material, practice, jam, get ideas and feedback from other artists. Even at some of the open mic nights, we are charged as a band to play our music,” says Safwan. He notes that established artists have great studios and equipment, but offer no mentoring, support or training to younger artists. “Even they are not making original music anymore,” he adds. They tried playing at Zamzama Park and Dolmen Mall and found themselves treated worse than terrorists. “The guards at the park told us that playing music there could lead to a crowd gathering around us and that could potentially result in a bomb blast,” says Billy incredulously. Granted even street musicians in Europe require permits and licenses to play in public places; this kind of treatment towards young talented artists who do not have a creative outlet feels a little extreme to me. “I remember the girls working at Mango at Dolmen started dancing all around the store and begged us to stay there longer,” says Billy, noting the dichotomous response to their experiment. “I remember once there was this really grim bearded man at the park who stared at us arms-crossed without blinking for a few minutes. We thought ‘oh no, we’re screwed!’ But when the song ended, he broke down and told us how much he loved singing and asked if he could sing an Indian song. That’s when another man saw him and dragged him off for namaz,” laughs Safwan. Despite the bans and barriers, us Karachiites always figure out a way around the system. Upon my return to Karachi, they inform me that a new Facebook group has popped up which has been started by a photographer who opens up his entire house to artists every Friday. Shikari promises me a house full of free food, jamming in every room, and interesting artists scattered all around. On Friday, I follow their car and end up outside a beautiful house in Defence. They introduce me to the photographer who welcomes me in like family, despite my lack of musical abilities. I settle myself first in the front lawn with a drink and a tambourine. It’s one of the most perfect nights in Karachi, summer has faded and winter is slowly starting to creep in. The crowd is a mix of young men and women singing good and bad, loud and soft songs. My awkwardness as a newbie at the jam fades away when a group asks me to join them. In the drawing room, Shikari hands out their stickers to some of the first-timers at the jam. In seconds, a loud confident girl with a jazzy sound hears their story and comes up with an entire song about being banned at Espresso. Everyone sways and sings along. I follow the boys to the next room and they look happy and at home. They look original and fresh just like their music. And it solidifies my belief about real artists; you can oppress us, repress us, depress us, but we’ll always find a way. Five things that could make the Lux Style Awards 2015 actually fun! "If you want to teach here, you have to wear a burqa"
” MUSIC STARVED ” audience. WoW. We are not living under the rule of taliban where music is banned. Its easily accessible all over the country. Last time I checked, my 2 yr old nephew had beats headphones on as well in this country that you are calling as backward in your hate mongering blog.